Diamond Stone really wanted to go to Wisconsin. Despite not being a recruiting enthusiast I learned of the 5-star center's collegiate intentions because I happened to see a forum post on this site about his recruitment and thought holy hell there's a basketball player named Diamond Stone. That translates to Stone Stone. Surely the reduplicating Milwaukee native grew up idolizing Badger great Duany Duany. This was meant to be; Stone was all ready to stay home and play for Bo Ryan...until he didn't couldn't meet Madison's academic entry requirements. Stone committed to Maryland right in the middle of Wisconsin's Final Four run (ouch). It's a fine school with a strong basketball tradition. The following week the kid who wanted to go to UW but couldn't get in was now openly rooting against the Badgers when they faced Duke in the title game. He's far from the first kid to begrudge a school he couldn't get into. Those same fans who couldn't wait to see him in Madison suddenly wore different emotions. There are hundreds of love notes just like the ones above carrying varying degrees of nastiness. Sports Twitter doesn't get any braver or more heroic than when it tweets insults at high school athletes - or in this especially courageous instance, 6'10" 253-lb high school athletes. That stranger hastily changed his handle from @DGus1228 to @DanGustafson1 to try and avoid criticism before deleting his account entirely. Apparently Dan didn't appreciate all of the unsolicited advice of strangers either. Meanwhile, Cardale's reply went viral. CBS, the Sun Times, the Washington Post, Rolling Stone, USA Today, Talking Points Memo, Huffington Post, and the Dispatch all ran stories celebrating his tweet while ridiculing the now-extinct account. ESPN both ran a story and filmed a segment. There was universal agreement: the stranger was out of line. He had the audacity to instruct a redshirt sophomore he did not personally know how to think and what to do - with the latter having everything to do with what he wanted ("worry about getting us fans another championship" verbatim). Stone took abuse for choosing a college he could get into. 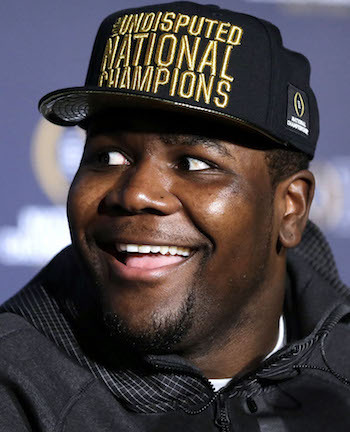 Cardale absorbed it for publicly expressing an opinion. The media made a pretty big deal about both events - but this happens with high school athletes every single day. Tweeting self-serving life advice, abuse and spam at amateur athletes is the HPV of Twitter. It's pervasive, an epidemic - and while definitely not the worst thing in social media - still ugly and unwanted. Hours later while the world was still busy celebrating Cardale's justifiable homicide, Jordan Stevenson - who signed a letter of intent to play football at Wisconsin - was reportedly unable to gain academic admission to the school either. For some Badger fans the news was like ripping off the Stone scab from April. Cardale's sick burn was still being retweeted thousands of times when messages like this started appearing in Stevenson's mentions. However, not all of them were passive-aggressive. @Jordanstevie2 just begging you to please remember badger fans still support you so just asking you to not go to a big10 school or bama. It's the sadder, far less radio-friendly B-side of worry about getting us fans another championship. Okay, Matt Gray. Jordan will select a college that pleases you. Last Spring I was chatting with Birm about recruiting and he pointed me to some Facebook posts from grown adult males to high school athletes the Buckeyes were recruiting. That conversation produced this column about why tweeting at recruits is bad, and people who do it should feel bad. L'affair Cardale last week was a reminder that this practice is almost universally despised - when it's visible. Most of the time it's out of public eye and tucked into the player's mentions. FANS Tweeting self-serving life advice and abuse at high school athletes is the HPV of Twitter. If you're ever in need of a good core workout, after you read Birm's excellent Hurry-Up segment on any given night pick a recruit from his report, find that kid's Twitter handle and look at his mentions. You'll quickly see how widespread this plague is and by the time you finish cringing you'll have rock-hard abs. Reminder: The only TUPAC in Tennessee is this one. Don't stop cringing yet because this is nothing; it's about to get both personal and bad - and this is an infinitesimally small slice of what amateur athletes see daily in social media. @TheDeuce_2_Nice Getting love from Ohio State rn, but we all know they're as fake as Drakes lyrics. Look, it's an Ohio State uniform that doesn't exist alongside a nice plug for Southern California's NFL pipeline, all captured in a single tweet that embodies the mindset of 100% of fans who tweet college advice at high school kids: I believe I'm helping. Friends, that is a Lamborghini Gallardo Spyder, an Italian sports car that retails at $181,900; roughly the same price tag as repairing Cecil Newton's dilapidated church. It is obviously parked on the banks of the Olentangy River in Miami. Not the Ohio Miami; the Miami Miami. Granted, there are 25-30 Lambos parked at the Woody on any given practice day - but this isn't one of them. The recipient of that tweet is current Florida State commit Levonta Taylor. The recipient of this one is Tennessee commit Justin Guarantano. You may be asking yourself why Tupac Shakur isn't sitting shotgun in the Lambo tweeted at Guarantano, and it's because he's dead he's a Tennessee fan. We've now come full circle. Don't get too upset with Laostar7. There are hundreds of Laostar7s. Rather than taking a flamethrower to Ohio State's many intrusive sports enthusiasts I chose to showcase only one. Every fan base has a sparkling collection of Laostar7s. The numbers of members enlisted in these brave militias vary by school. Many of them tell Diamond Stone he's dumb from a safe distance; others mock Jordan Stevenson's tattoos while the chosen few make national news at Cardale Jones' behest. Most of them try to get high school kids to make college choices that make them happy. And all of them should feel bad about it, but they don't - and you cannot stop them. You can only stop yourself.